When my oldest son was five I started reading the Chronicles of Narnia to him. Every night, after I put his little brother and sister to bed, we would lie on my bed and I would read until he fell asleep. At first it didn't take very long for his eyes to close. But it was amazing to watch him grow right in front of my eyes and before we finished the first book we could read a whole chapter and he would still be awake. It took us months to finish the series and I'm not sure who enjoyed it more, him or me. But I had four children so got to read it to them two more times (the middle two kids are very close in age and more than 3 years either way from the oldest and youngest), plus I read it to my oldest son's second grade class when his teacher got Bell's Palsy and was no longer able to read to the children. I'm sure I read it at least two other times on my own, once as a child and once more as an adult. In case you haven't figured it out, I love to read! One of my parenting goals was to help my children love to read, too. I think my oldest is the only one who caught it as "bad" as I have it, but I don't think the others are opposed to reading! And I know they all enjoyed the books we read together. This list isn't anywhere near exhaustive, but these are some of the books we read to our children, some we read three times to our three "groups" of children--oldest, middles, youngest. I hope you read to your children even when they get past the picture book stage. Maybe some of these perennial favorites will get you interested! Little House on the Prairie--the whole series! When we were reading this with our "middles" I had just discovered the Internet (so had pretty much everyone else in the mid 90s) and I looked up Laura Ingalls Wilder and discovered that she died only a few years before I was born! I had no idea that someone who had lived in the days of pioneers could have been someone I met as a child! Of course, my kids still thought it was ancient history. Regardless, we all loved the stories. The Chronicles of Narnia--as I've already mentioned, we read this one several times. I enjoyed it every time! They are not only well told stories, but they can provoke deeper thoughts as you consider the theology C.S. Lewis is teaching through his stories. God's Smuggler--this story about a boy who, unbeknownst to his parents, did his part in the Dutch resistance, who ran from God, and eventually was used greatly by God behind the Iron Curtain, has enough excitement and action to interest almost any boy or girl! There's also history, the gospel, and ministry. This is one of my favorite books which I have read many times, yes, including to my children. From the Mixed Up Files of Mrs. Basil E. Frankweiler--I first read this book when I was in fifth grade and loved it. I couldn't wait until my children were old enough to enjoy having it read to them! My favorite genre is biography, but I am always amazed at what there is to learn in fiction too. This is a fun book about a bossy big sister and a sharp thinking little brother who run away from home and live in a museum and solve a mystery! The Adventures of Pippi Longstocking--My husband found a copy of this book in our home library and read it to our six year old redhead. Her older brother and sister listened in and thought it was great fun, too. Anne of Green Gables--and the whole series were more books we read because of our redhead. Being the youngest, I enjoyed having this time with her when she was probably in fourth and fifth grades. Sometimes the things we talk about with the others she says she didn't get in on, but she can't say we didn't read to her! The Phantom Tollbooth--another book I remember reading in grade school, I knew my oldest son would love the numbers side of this story. But there's enough silliness and fun about a boy who receives a mysterious package that has a car he drives through a tollbooth, also in the package, that he puts together and ends up in another land, for all my kids to have enjoyed it. Alice in Wonderland--this classic along with Through the Looking Glass are just thing to start reading to your kids on an evening when they can't go outside because it's raining or they are sick. You will all probably go around saying, "Off with her head!" for months to come. All Things Bright and Beautiful--and the other books in this series. Whether your kids are animal or science lovers they will enjoy the humor and stories in these books. Who knew a veterinarian could write so well? Charlotte's Web--before my kids had the video, I read the book to the three oldest ones. My youngest had it read to her in second grade by a teacher who did a whole unit on spiders around it, thus giving my seven year old daughter a love for spiders and she brought home a jar full of them that escaped all over the house...but that's another story. The Hiding Place--this is my all time favorite book. I don't know how many times I've read it. Before we had kids, I even read it to my husband on a car trip! I read it to each of my children as well. A single woman, the first licensed watchmaker in Holland, and her father risk their lives to save Jews in World War II and end up in concentration camps. It's an amazing story of faith and God at work. Any book you love qualifies for reading to your kids. And when you are already together around the table might be a good time to start reading. Just remember, stop reading at an exciting part so they will want to hear the next part tomorrow! 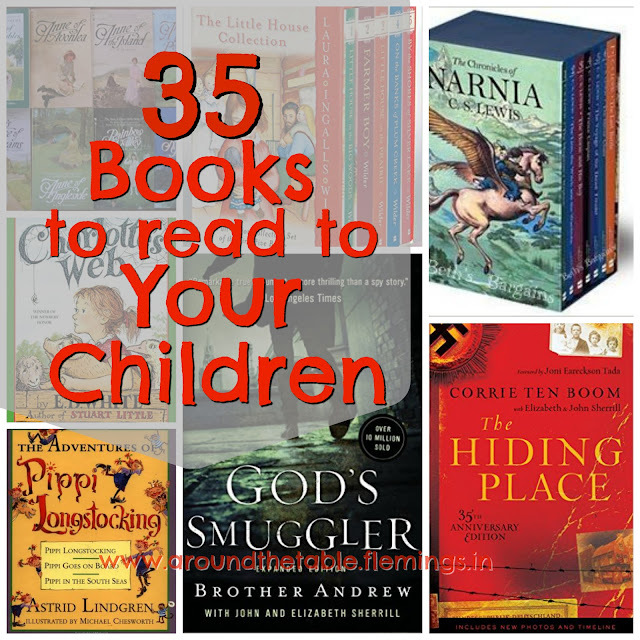 what a great list for reading to tohe Grands--now that I'm of a certain age. Thank you for these suggestions! I'm always looking for more books my kids will love! And remember that there are 35 books when you count all the books in the series. But never force them to keep listening in a series they really don't enjoy. That doesn't reach goals. LOVE this! I read to my 21 month old all the time, regardless of whether he's listening or sitting with me - I'm always up for some new material! It helps to start young! Great list! We've only read a few of these so far. Thank you for the list. My kids are teens and I'm having trouble getting them to sit still for reading aloud. You may not be able to do it forever, but a good book might hold their interest. One way is to listen to a well read audio book (Blackstone Audio is a good source and my library has many) when you are on a trip in a car. You have a captive audience there! :-) Just stop at exciting points so the want to come back to it. So many great reads! Thanks for putting this together and sharing at the Homemaking Party!